The US-Mexican War determined the southwest border of the United States as we know it today. Fighting began after the 1845 annexation of Texas and ended with the Treaty of Guadalupe Hidalgo on February 2, 1848. The territory gained would ultimately become the states of California, Nevada, Arizona, New Mexico, Utah, Texas, and Colorado, with portions contributing to Wyoming and Kansas. Mexican War Service Records contain valuable first-hand information about battles, troop movements, officers, and soldiers. While the United States had a standing army at the time, most of the soldiers who fought in the Mexican War were volunteers from various states. At present, there are five sets of records on Fold3 with information on forty-four units, and the men who served in them, from Mississippi, Pennsylvania, Tennessee, Texas, and the Mormon Battalion. Muster Rolls provide details on Promotions, Payments, Casualties, Those killed in battle and deserters, as well as physical descriptions. Unit information includes company muster rolls naming recruits, deserters, and those on special assignment; and regimental returns with battle histories and casualties. Company locations—the National Palace Mexico, Lobas Island in the Gulf of Mexico, and Camp nr. Jalapa Mexico—provide geographic perspectives. Other titles on Fold3 round out the Mexican War Collection. 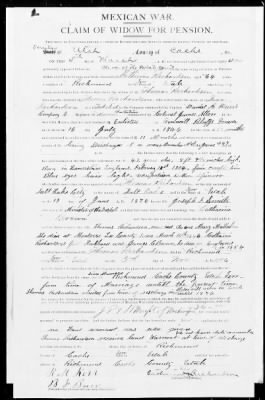 If you’re interested in a Pennsylvania soldier, alphabetical service record abstracts in the Pennsylvania Archives match the imaged service record cards within the state’s two regiments. For Mormon Battalion soldiers, you can pair service records with the Mormon Battalion Pension Files. Explore the Mexican War Service Records to learn more about the men who served in this geographically critical war.